Are you trying to sell your Indianapolis, INhome in the New Year? In some situations, staging is an option that can yield excellent results. This may seem like a daunting task, however, it is important to depersonalize your home for prospective Indianapolis, IN homebuyers. Some professional staging companies can be costly, however there are other options for Indianapolis, IN home sellers. 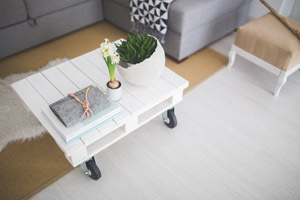 First start with decluttering your home. If you want to take it a step further there are some staging tips you can tackle yourself without having to hire a professional. Your goal is to create an environment where potential buyers can picture themselves living in the home and are able to view your home objectively. Living Room. In the living room create a focal point and arrange the furniture so it is positioned for conversation and entertainment. Bring some of the outdoors in with new plants or cut flowers. Bright fresh flowers will also add a pop of color. Bedrooms. In the bedrooms make sure each is set up as such. If needed, an inflatable mattress dressed with sheets and a comforter will do in a pinch. In the master bedroom update your old boring comforter set with a new luxurious set. It doesn’t need to be ‘expensive’, many outlets sell full sets for around $100. Bathrooms. In the bathrooms add some decorative touches with new hand towels and a candle or two. Some dried or fresh flowers to complement the towel color will pull the room together. Kitchen. In the kitchen accessorize, accessorize. Since your countertops are nice and clutter-free you have space to add a pop of color with a decorative bowl or vase well-placed. If you want to be remembered by those who view your home, put out a colorful bowl filled with candies or prepackaged snacks, like pretzels. Some water bottles will also be appreciated. Tie the look all together with new kitchen towels in coordinating colors. If you still don’t know what to do about prepping your Indianapolis, IN home to sell then talk to a professional! As Indianapolis, IN real estate agents we are well versed in what it takes to get the job done. Please contact an Indianapolis, INreal estate agent and we can point you in the right direction. We look forward to hearing from you!